Can a Sustainable Gardening Experiment Go Right? Posted 8:05 am by Chris & filed under Organic Gardening. That is the question that I have been working on for about a year now. I had many questions about how to grow our own food effectively at an elevation of 7,000 feet above sea level, with no usable soil. My wife and I have grown in containers, raised beds as well as the all original row and hoe methods in gardens larger than 1 acre. But the challenge was to see if we could grow a garden in a mobile home park at 7,000 feet elevation with no real soil to speak of, and NOT build an expensive (either time or money) raised bed system. Here, we are in the middle of an area that had more gravel and not much growing when we started. We bought the food4wealthsystem and implemented so as to take advantage of the items that we could purchase for little or now cost. After all, our experiment was to build the sustainable gardening plot, which means once it is created it would not take much more investment on our part, that could feed us without much work on our part. What were our challenges as we started? Seeds or Starts, what works best? That is not really a large list when you look at it now, the time factor was the biggest challenge for us. You know how it is, you need to work to make money to pay the bills. Family obligations, social expectations, vehicle maintenance challenges, continuing education classes, etc. You know them all right? What are your challenges in this area? What did we like best about the help we received from Food4Weatlh? What we struggled with, or did not necessarily like? The videos were good, I didn’t like hearing and seeing the same introduction music each time. Our Costs have been minimal. Even after spending the $99 dollars for the mini-greenhouse, we were still way under the $200 budget. We wanted to stay close to the teachings of the Native American teachings of leaving a very small footprint and only taking what was needed. Food4Wealth has helped us simplify our workload, down to almost nothing. The Abundance that has been realized also allows us to share with others and inspire a few so far to also start growing food and enhancing their landscape that benefits them as well as the four legged and winged neighbor that surround us. Truly a much more enjoyable environment for the children that flock to our house and ask Heather, my wife, to show them the taste and texture of an abundant garden! Both my wife and I highly recommend this system, there is nothing like having a garden party with friends and family, eating fresh right out of the Garden! 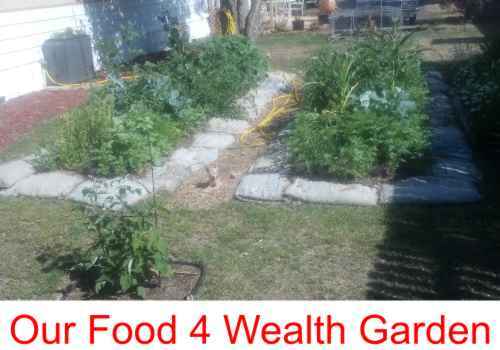 Download your copy of this Food4Wealth System now!